Our primary program we work with is Illustrator. Files sent in this format require less system time to prepare for plating. We also have Photoshop, InDesign, Quark Express, and Corel, but they may not be the latest version so please check with us. Over 90% of all digital flexo plates globally are imaged on a CDI, demonstrating that flexo printers insist on CDI plates and sleeves for their work. They attain superb results that before were only achievable in offset or gravure. With CDI, trade shops are able to offer superior quality, while printers receive print consistency. 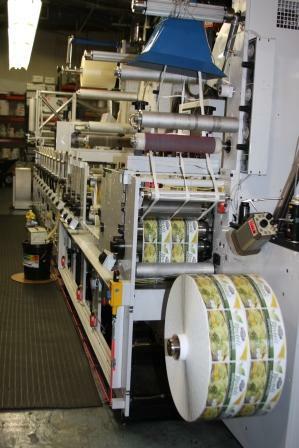 We here at Creative Labels utilize the most cutting edge screening technologies to ensure your screen work comes out unlike what you have seen with your average label printers. Our screening helped us achieve 2 silver medals from the San Francisco Gallery and a silver from the National Association of Litho Clubs on our most recent print competitions. DuPont™ Cyrel® FAST system is a revolutionary technology that offers enhanced pressroom productivity. This equipment is used to do color draw downs when mixing ink for specific PMS colors or color matches. Done mechanically instead of by hand, the drawdowns delta variations are minimized from one to the next. This color spectrophotometer with its software reads color and furnishes a delta difference between the target color and the drawdown done with the mixed ink. It also will give a PASS/FAIL reading on printed colors, maintaining the reference color in the equipment database. This takes the human element and guess work out of the equation when mixing colors. For short run decals on, vinyls, etc. this digital printer is used. It can print High resolution photo images and contour cut them. This can be used for indoor or outdoor decals. For outdoor decals, fade resistance and durability are very good. It will even print white on clear. For short run decals on, vinyls, etc. this digital printer is used. It can print high resolution photo images and contour cut them. This can be used for indoor or outdoor decals. For outdoor decals, fade resistant and durability are very good. Running LabelTrax SoftwareThis specialized software handles our estimating, order processing, tracking, scheduling, job cost analysis, On Time delivery, projected orders, and a multitude of specialized reports. It can also do an incredible amount of custom searches to find whatever is needed. We can include you in our "Projected Order Alert" program for your convenience. These printers are used to do "On Demand" barcodes, sequential numbers, and other variable printing or to fill simple short run needs. Silver foil printing, durable Property Asset labels, outdoor numbered decals are only a few of the kinds of labels done on these printers. The Newfoil can foil stamp up to 6 colors diecut and emboss labels. 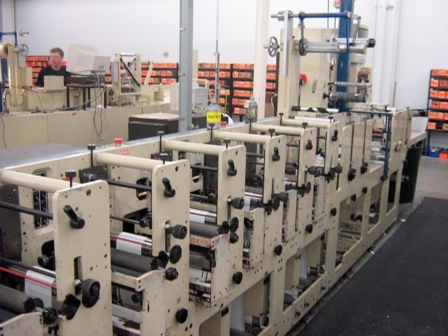 This press is perfect for ultra small orders or foil decorating flexo printed labels. It really shines on our Wine, Spirit and cosmetic labels. Wouldn't you like to add some Gold or Silver foil to your label? The Ikela can be used on either of our 13” Flexo presses to do longer runs. It is currently working with our Servo 2200 to do wine and cosmetic labels. 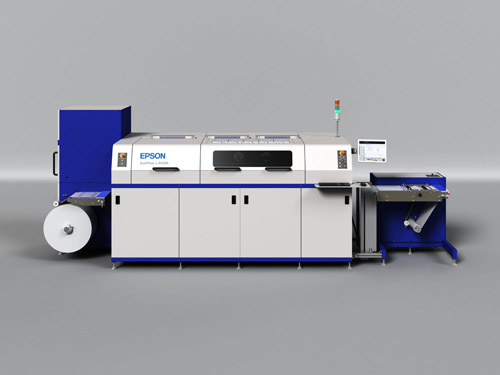 The Epson digital label press capitalizes on Epson's acclaimed MicroPiezo® ink jet technology to create output with smooth gradations and incredible color quality. The L-4033A has six-color (Cyan, Magenta, Yellow, Black, Orange and Green), industrial-quality, water-based ink set produces a remarkable range of colors for impressive, professional and consistent results. 10 Color Mark Andy Servo 2200 13"
This press was installed in January of 2009. It is a brand new Servo motor driven press. It has the following options, 4 movable UV units, Corona Treater, Auto Register, Helical gearing, dual side web cleaner. This press also has 2 independent video inspection units on it. 6 Color Mark Andy 4120 10"
This press was the premier label press throughout the 1980’s. We have updated it with newer technology and have added the ability to print unlimited colors with it. It has been modified to allow us to utilize our Cold Foil Transfer for the customers that want that Hot Stamping at a reasonable price. 6 Color Mark Andy 2200 10"
This Mark Andy 2200 is the perfect press for the smaller runs. We also run roll to roll, roll to sheet, front and back printing and UV overprinting varnishes on this press. All of our presses are equipped with video inspection for better in line inspection. This press is used for both UV and water base printing. The majority of our 4 color process work is done with UV inks on this press. It can run roll to roll, roll to sheet, laminated, back print, emboss, and cold foil print. All of our presses are also equipped with video inspection, this press having two separate monitors for viewing from different ends of the press. The Mark Andy 830 is an industry workhorse. It can print up to 3 colors with 3 diecut stations. This press is ideal for our customer’s short runs. Our on press variable information system can do numbers, barcodes or just about any other information you desire on your label. There are many colors of inks we can get for it so just let us know. The Rapid RP-250 can foil stamp up to 6 colors diecut and emboss labels. 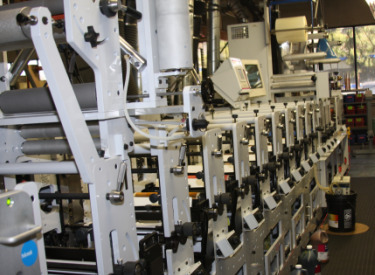 This press is perfect for ultra small orders or for foil decorating flexo printed labels. 8 Color Legacy Press LG13 13"
This is a high speed Servo driven slitter inspection rewinder made for both slitting and rewinding raw stock to inspecting slitting and finishing your label products. We added an Arpeco Tracker with an extended inspection area to increase the capacity of our inspection rewind department. This rewinder features a high intensity strobe, flag detectors, and a roll lift for operator safety. This is a Servo driven slitter inspection rewinder made for both slitting and rewinding raw stock to inspecting slitting and finishing your product. This unit is used for inspection and rewind and to slit material to the proper width for press. It features a high intensity Unilux strobe light. These are used to rewind our smaller runs frequently and to inspect our sequential barcoded and numbered labels. These SpectorEye is the right assistant for quality control inspections for both incoming and outgoing goods. It helps you achieve and maintain the most stringent quality standards - from raw materials to finished products. The Guardian Inspection System™ OLP model can automatically find and highlight differences in print quality from an approved master image. The Guardian OLP can compare one-up electronic file or scan to a multi-up electronic file or scan. This system will detect printing defects such as missing or extra print, pre-press errors, plate defects and color variation. Discovery Revolution is a comprehensive print quality and data integrity inspection solution which simultaneously identifies print defects and data integrity errors. Based on a single camera and PC platform, Discovery Revolution enables printers and converters to ensure properly printed barcodes, human readable characters, identify missing/duplicate labels, ANSI/ISO barcode grading of all codes, create "track & trace" audit trail reports while simultaneously identifying and recording print quality errors. Capable of operating at speeds in excess of 1000 FPM and identifying defects smaller and 0.0003 square mm.